TRiNDS has two job postings open in two cities at TRiNDS Careers. In Washington, DC we are looking for a contract Clinical Data Manager to join our data management team. The second opening is for an in-house Clinical Research Associate to work in our Pittsburgh, PA office with our clinical operations team. TRiNDS is a great place to work and grow. Our expert teams specialize in neuromuscular research and clinical trials conducted around the world. We collaborate with innovative clients, expert researchers, and key opinion leaders to generate research success that matters to families affected by rare diseases. Are you interested in joining the team? Do you know the perfect person for these positions? Apply today at the link above. We look forward to hearing from you! Clinical trials can be difficult to manage. Trial sites around the world have different local institutional and ethical rules. Central study teams work with multiple different scientific and company stakeholders. Regulations governing clinical trials and drug development require comprehensive and accurate record keeping. And everything needs to be finished on time and on budget. Rare disease clinical trials present unique management challenges. In rare disease clinical trials, eligible participants are much harder to find and sample sizes are smaller, making each detail of the trial even more critical to its success. TRiNDS Clinical Operations offers customized trial management to researchers around the world. We assign a lead project manager to your project from the first feasibility assessment to final closeout. Our experts follow established guidelines and procedures to help trials stay on track throughout the course of the project. We’ll work with you to create the plans, strategies, and metrics that your trial will need. We help your team work together effectively for the rapid start up, on target enrollment, regulatory compliance, and accurate data that your research program requires. TRiNDS offers expert clinical operations support to research studies and clinical trials working with neuromuscular and other rare diseases. Contact TRiNDS today to request a quote. Every year, on the last day of February, the world celebrates Rare Disease Day. One day a year, we honor the patients and families living with a rare disease around the world. Rare diseases affect 1 in 20 people at some point in their lifetime. Even though there are many different rare diseases, everyone faces the same kinds of struggles. A lack of awareness and scientific knowledge delays diagnosis. Lack of funding for research slows development of effective treatments. Families struggle to access high quality health care where they live. 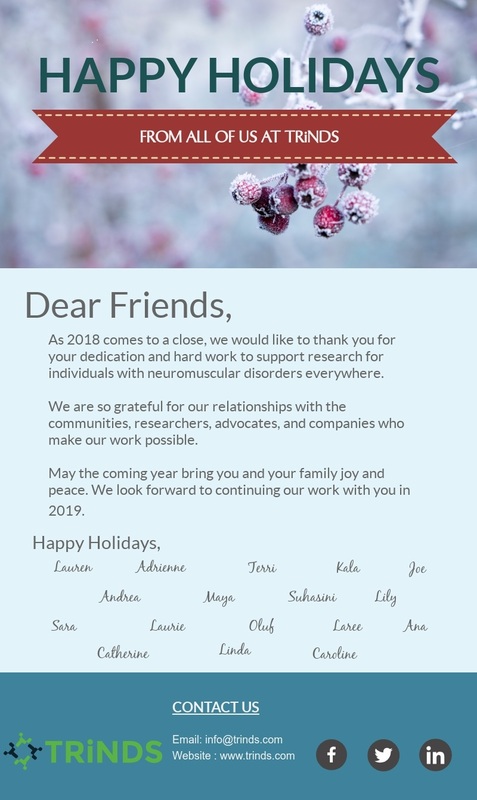 All of us at TRiNDS are so grateful to work with scientists, families, and community groups to help find new approaches to rare diseases around the world. Join us in celebrating Rare Disease Day by visiting www.rarediseaseday.org to learn more. TRiNDS offers customized services for rare disease clinical trials and research studies. We work with companies large and small to find research success. Contact us today to request a quote for your project. Rare disease clinical trials are not the same as other trials. The paperwork and research rules might be the same, but everything else is different. The tests are different, the providers are different, but most of all, the families are different. People who are coping with a rare disease have different experiences, different fears, and different hopes than people with other kinds of diagnoses. These differences are at the core of why we do what we do at TRiNDS. We know that conducting clinical trials are both essential to helping people with rare diseases and ask families to add stress to already stressful lives. Helping researchers navigate these issues is a core part of what we do. TRiNDS Patient Science Liaison services offer customized advocacy, patient outreach, and research education services to researchers working with rare diseases. We can help connect you to the patient groups working in the community and help connect families to your trials. We’ll help you make the materials and strategies that you’ll need to recruit and retain eligible patients to your studies. Do you have an advocacy team? We can help extend your team by attending more events, creating special materials, or answering central inquiries. TRiNDS offers expert research patient advocacy supports to research studies and clinical trials working with neuromuscular and other rare diseases. Contact TRiNDS today to request a quote. The October 2018 issue of Pediatrics included a set of critical documents for the good care of children with Duchenne Muscular Dystrophy (DMD). The special supplement included a series of 12 articles outlining best practices for multidisciplinary management of DMD. These articles build on the 3-part Lancet overview articles published in January. Everyone agrees that good DMD care requires close collaboration of different specialty providers across the lifespan. Management of different aspects of the disease require information sharing between providers and families and an adaptive approach to the different stages of the disease. Be sure to read the new supplement and to share it with your colleagues in your clinics and hospitals. Are you getting ready to launch a research trial in DMD? Be sure that your CRO understands the clinical care your trial patients should be receiving. Contact us today and request a quote for our customized clinical trial support services.